The book presents a Comparative Study of some of the leading systems of Music in India from the fifteenth to the eighteenth century A.D.
Indian Music has been undergoing a marked change since very early times. The old system of grama, murchana, jati of the grantha Sangita yielded place to Raga-Ragini or the Janya-Janaka theory, the Thata Raga to-day. In Northern India the old, sruti system underwent a tremendous change. The Mahomedan rulers had brought with them their own system of Music with new melodies, new styles of interpretation, new types of songs, new Talas which in course of time got fused with Hindu Music and give rise to modern Hindustani Music. The present book deals with the exposition of grantha Sangita, that is, of Srutis, Svaras, Ragas etc. as noted in some of the leading Sanskrit works. It takes up a number of works in Sanskrit and analyses their contents, while on some important issues it offers useful comments it attempts to provide a missing like between the old tradition and the current practice, exploring the causes which brought about renaissance or reformation. It is a source book helpful to the student of research and even to the moderate lover of Music. The First Edition of the book was sold out long ago and in spite of continuous demands for its copies, a fresh edition could not be published earlier, owing to various difficulties. In preparing this edition the old text has been revised and several additions have been made at many places, particularly in the first four chapters. The historical survey taken in the First chapter now covers a much wider field and has been brought up-to-date. It contains such new topics as the Suddha scale of the Naghamat-e-Asafi, notes on Col. Peter and Capt. Willard, Bengali tunes, and a critical appreciation of some latest books on Indian music. The laws of musical sound given in. the Second chapter have been treated at greeter length and are further explained in the light of the subjective experience of a listener. In the Third chapter which deals with the Evolution of the Musical Scales, a positive and constructive approach to the Sruti-Doctrine and its verification is given in as simple and clear a manner as possible. The Fourth chapter is entirely rewritten and contains the substance of my research, conducted under a Research-grant from the University of Bombay since after the publication of the First Edition and gives an analysis of the musical structure of the various non- classical forms of musical expression such as Vedic chant, Samagana, Recitation of the Poetic Metres and the tunes of Folk-Songs. It also contains an analysis showing how non-classical forms start from poetry and make music subservient to it, while the classical forms start with music and make poetry the hand-maid of music. Some very interesting methods of effecting climax are described in the appendix to that chapter and should prove to be thought-provoking. The appendix also contains some thirty illustrative specimens rendered into musical notation, to substantiate the conclusions arrived at. 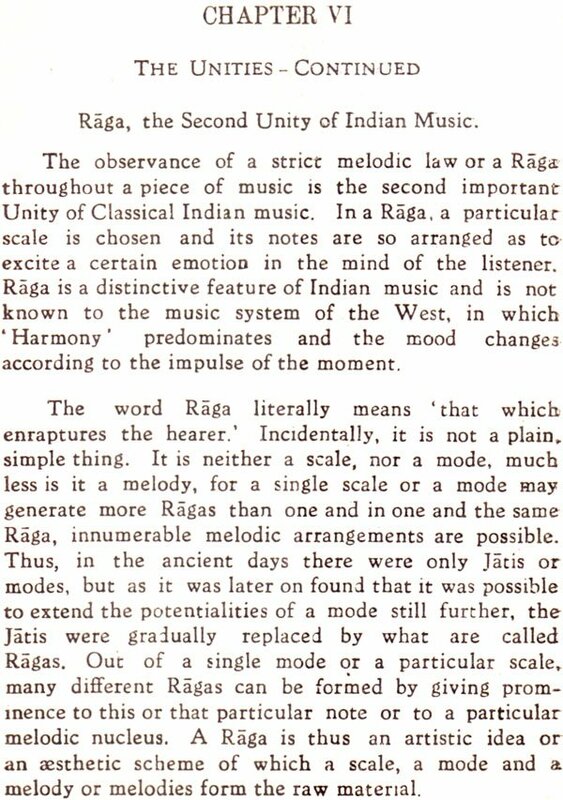 The Fifth, Sixth and the Seventh chapters contain a full scientific discussion of the three Unities of Indian Music and of how they shape its AEsthetics. The Eighth chapter deals with the several forms of Classical music. In the Ninth and the last chapter, it has been shown that the Rasa-Theory, as expounded by the old Sanskrit traditionists, has its own limitations and cannot explain the Rasa of music at its best, which latter easily leads one into a state of complete self effacement, culminating in a higher consciousness which words have no power to describe. The book is intended to be a general guide to the Physics and AEsthetics of music, in general, and Hindustani music, in particular and contains many original topics suggesting new lines of research. I do not however arrogate to myself the right of speaking for the South Indian system of music and leave that work to South Indian scholars, themselves. My special thanks are due to the University of Bombay for its 'Publication grant' to the First Edition of this book and also for an- other 'Research grant' for prosecuting further research regarding Folk Music, the substance of which is now included in the Fourth chapter of this Edition. I take this opportunity of expressing my sincere thanks to the Government of Bombay for having called me to act as Member and Secretary of the Committee, they had appointed in 1948, to survey the whole field of Music Education in the Province. I had thus an opportunity of studying the existing condition of music education at close quarters and in the light of information received in official and private dicussions, I have reason to believe that the need for such books is felt all the more keenly. In fact, some of our School-Boards and Universities have already prescribed the book either as a text book or as one for general reading and I trust that they too will find the New Edition quite useful and dependable for a methodical and critical study of Indian Music. I have to thank my former colleague Prof. D. G. Dhavle, now University-Professor of Physics, Poona University for his help and advice in the preparation of this edition as well. I also thank all the other gentlemen who have been of help to me in one way or another. My thanks are due to the Aryabhushan Press and its staff for the great pains they took in carefuly printing this edition too. Last but not the least, I express my deep debt of gratitude to my former patron the late Shrimant Narayanrao Babasaheb Ghorpade, late Chief of Ichalkaranji, whose sad demise took place a few years ago. In preparing this edition the old text has been revised and several additions have been made at many places, particularly in the first four chapters. The historical survey taken in the First chapter now covers a much wider field and has been brought up-to-date. It contains such new topics as the Suddha scale of the Naghamat-e- Asafi, notes on Col. Peter and Capt. Willard, Bengali tunes, and a critical appreciation of some latest books on Indian music. The laws of musical sound given in the Second chap- ter have been treated at greater length and are further explained in the light of the subjective experience of a listener. 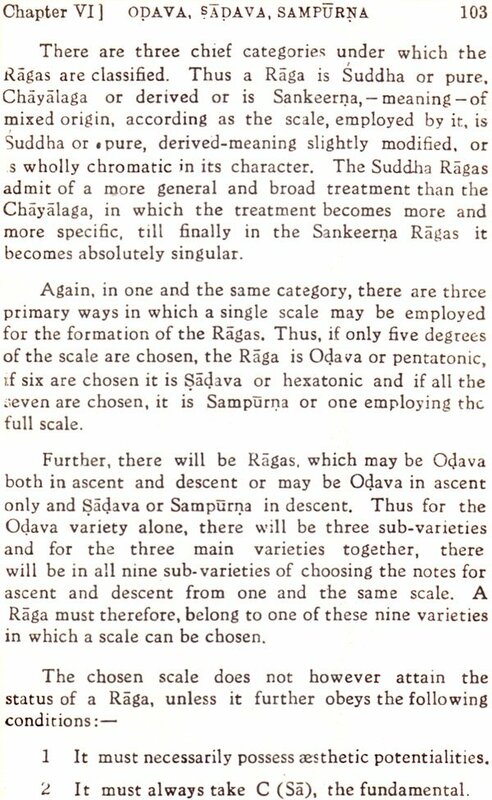 In the Third chapter which deals with the Evolution of the Musical Scales, a positive and construct- ive approach to the Sruti-Doctrine and its verification is given in as simple and clear a manner as possible. The Fourth chapter is entirely re written and con- tains the substance of my research, conducted under a Research-grant from the University of Bombay since after the publication of the First Edition, and gives an analysis of the musical structure of the various non- classical forms of musical expression such as Vedic chant, Samagana, Recitation of the Poetic Metres and the tunes of Folk-Songs. It also contains an analysis showing how non-classical forms start from poetry and make music subservient to it, while the classical forms start with music and make poetry the hand-maid of music. Some very interesting methods of effecting climax are described in the appendix to that chapter and should prove to be thought-provoking. The appendix also contains some thirty illustrative specimens rendered into musical notation, to substantiate the conclusions arrived at. The Fifth, Sixth and the Seventh chapters contain a full scientific discussion of the three Unities of Indian Music and of how they shape its AEsthetics. The Eighth chap- rer deals with the several forms of Classical music. In the Ninth and the last chapter, it has been shown that the Rasa- Theory, as expounded by the old Sanskrit traditionists, has its own limitations and cannot explain the Rasa of music at its best, which latter easily leads one into a state of complete self-effacement, culminating in a higher consciousness which words have no power to describe. The book is intended to be a general guide to the Physics and AEsthetics of music, in general, and Hindusthani music, in particular and contains many original topics suggesting new lines of research. I do not however arrogate to myself the right of speaking for the South Indian system of music and leave that work to South Indian scholars, themselves. My special thanks are due to the University of Bombay for its 'Publication grant' to the First Edition of this book and also for an- , other 'Research grant' for prosecuting further research regarding Folk Music, the substance of which is now included In the Fourth chapter of this Edition. I take this opportunity of expressing my sincere thanks to the Government of Bombay for having called me to act as Member and Secretary of the Committee, they had appointed in 1948, to survey the whole field of Music Education in the Province. I had thus an oppor- tunity of studying the existing condition of music educa tion at close quarters and in the light of information received in official and private discussions, I have reason to believe that the need for such books is felt all the more keenly. In fact, some of our School-Boards and Universities have already prescribed the book either as text book or as one for general reading and I trust that they too will find the New Edition quite useful and dependable for a methodical and critical study of India Music. I have to thank my former colleague Prof. D. G Dhavle, now University-Professor of Physics, Poona University, for his help and advice in the preparation 0 this edition as well. I also thank all the other gentle men who have been of help to me in one way 0r another. My thanks are due to the Aryabhushan Press ant its staff for the great pains they took in carefully printing this edition too. Last but not the least, I express my deep debt 0f gratitude to my former patron the late Shrimant Narayanrao Babasaheb Ghorpade, late Chief of Ichalkaranji, whose sad demise took place a few years ago.